Moksi’s first ‘track’ was nothing more than a 45-second snippet—which later became ‘Getting Higher’—but even that was enough to get them noticed by Yellow Claw. Soon after, Samir and Diego were recording their debut EP Brace Yourself (which includes ‘Getting Higher’) for Yellow Claw’s Barong Family label: no high expectations, just having some fun and tinkering with a couple of melodic ideas. Needless to say, the release blew up and led to Moksi playing their first ever DJ gig at the huge Tomorrowland festival in 2015. Now firmly part of the Barong Family, Moksi went and branched out, embraced their creativity and came up with four tracks with incredibly hard-hitting drops, compiled on The Power of Moksi EP. After remixing the likes of DJ Snake (‘Propaganda’), Valentino Khan (‘Deep Down Low’), Hardwell (‘Mad World’), Kill The Noise & Dillon Francis (‘Dolphin on Wheels’) and Yellow Claw (‘Til it Hurts’, ‘Feel It’, ‘No Class’), Moksi delivered their third EP in the summer of 2016. The Majestic EP included the massive ‘Lights Down Low’ and was quickly followed by a major collaboration with DJ Snake of ‘Turn Down For What’ fame. 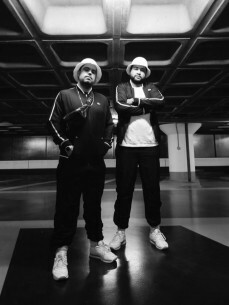 Moksi was featured on the French artist’s debut album Encore, amongst such luminaries as Skrillex, Travis Scott and even Justin Bieber. All of that is impressive, but there’s more. In september, Moksi released their most catchy single to date as a collaboration with fellow Barong Family member Chace, titled ‘For a Day’, went on a tour of Australia and then joined paters familias Yellow Claw for the huge Barong Family World Tour. Once they get going, Moksi are never slowing down.